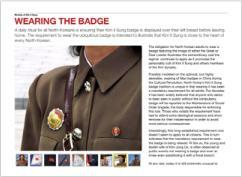 North Korea prevents its citizens from accessing any form of independent media. Any citizen who attempts to access foreign broadcasts to seek information from the outside world risks being interned in one of the state’s notorious prison camps. The very few visitors to the country are strictly forbidden to bring into North Korea radios or other communications equipment. As a result, little independent and objective information about the propaganda based mass-media of the country has been gathered or published. 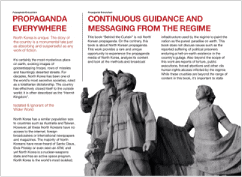 Over successive trips into each province of the country, Behind the Curtain has smuggled monitoring and recording equipment to capture and analyse the propaganda and broadcast media used by the North Korean regime as a prime instrument of control over the population. 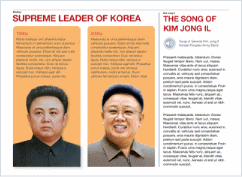 The North Korean "Kim Family Cult" is propagated by the world's largest myth making factory, the state-controlled media apparatus. 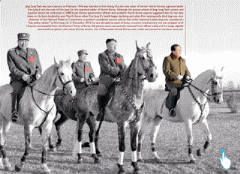 Behind the Curtain analyses and explains how these myths keep the Kims in power. Beyond the Curtain features stunning photography taken inside North Korea. Frequently taken without regime approval, the photos capture the pervasive propaganda that controls all aspects of the lives of the people. 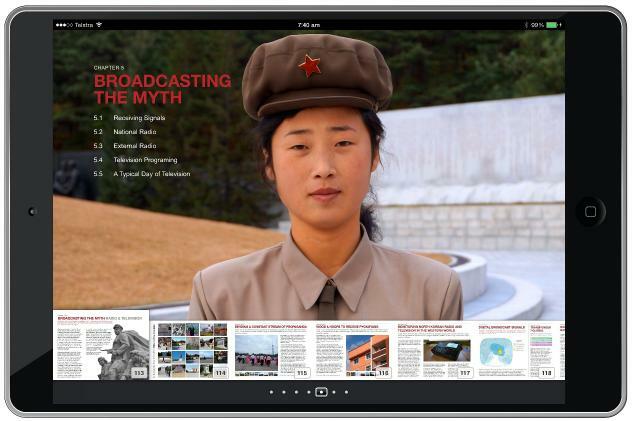 Hours of full-screen video provides a rare and unique opportunity to experience a full day's viewing of North Korean television. AirPlay lets you wirelessly stream videos to your TV via a connected Apple TV. 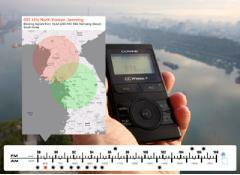 North Korean national radio is rarely heard outside the country. Behind the Curtain features hours of recordings of all internal radio networks as well as jamming used by the regime to block broadcasts from the outside world. 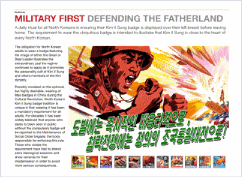 Interactive graphics - from a multilayered display of Kim Jong Un's bloody purging of political rivals to a illustration of the daily propaganda war of words on the Korean peninsula - bring static information to life. 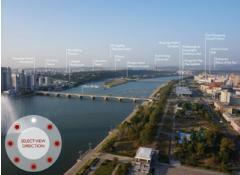 Embedded applets provide interactive panoramic views of key propaganda landmarks, dynamic radio bandscans in downtown Pyongyang and a unique trip to North Korea's most sacred propaganda location - Mt Paektu. Behind the Curtain features colourful examples of the frequently violent propaganda street art as well as the giant sculptures of the "benevolent" leaders erected in every city and town across the country. 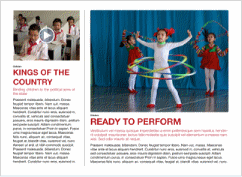 Unique content collected inside North Korea provides a rare opportunity to experience the nation's propaganda media, analyse its content and understand how the regime presents the country as the purest paradise on earth. Behind the Curtain on the iPad and Apple Mac computers offers a immersive full-screen experience of interactive diagrams, photos, audio and video. Multi‑Touch interaction enables you to flick through photo galleries, launch multimedia applets, tap to pop up sidebars, or play video and audio. Navigate through the book by simply sliding a finger along the bottom of the screen. Highlighting text, taking notes, searching for content is just as easy.